Life would be so much easier if we had a reliable way to create anti-foams. The one equation that everyone knows is unhelpful because it only tells you if the system would NOT be an anti-foam, which is little help because most plausible anti-foams pass this test. The problem is that there is an extra factor, the Entry Barrier, which so far has eluded attempts to quantify and to find reliable ways through. Because we often see (bad) foam formulations collapse very quickly and often find it difficult to create good foams, it seems surprising that deliberately destroying a foam can be hard. Yet many an antifoam formulation has ended up making the foam worse. The task here is to set out some clear rules that a formulator can use to create good antifoams. 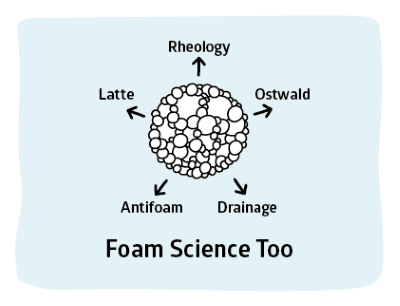 Unfortunately it is universally acknowledged that antifoam science still leaves many practical uncertainties along with plenty of academic confusion as to what is really happening. Antifoam science is difficult both theoretically and experimentally! 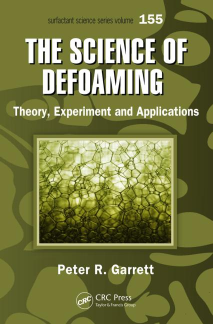 For those who want a thorough exploration of all things antifoam, The Science of Defoaming: Theory, Experiment and Applications by Prof Peter Garrett is an excellent source. Entry coefficient: E=γAW+γOW-γOA. If E is negative the aqueous phase completely wets the oil drop, stopping it from getting to the foam interface. So E must be positive for an antifoam. Spreading coefficient: S=γAW-γOW-γOA. If S is positive then the oil can spread along the foam, contributing to its breakup. There is major disagreement about whether oil spreading is important and there are studies both confirming and refuting the idea that S is important. Some of these disagreements arise because of "equilibrium" issues discussed below. Here you can see how changing any of the interfacial tensions changes the three parameters. A red box indicates that the conditions are OK (and a green box not OK) for antifoaming. These ideas are easy to grasp, the three γ values are easily measured and the calculations are simple. There are, however, a number of big problems. Because it takes time to reach the equilibrium value, and because of the issues of dynamic surface tensions, there is no reason why an antifoam that works well when foam is generated vigorously (short timescales), e.g. with harsh shaking will work well when foam is generated gently (long timescales) e.g. with gentle bubbling. The spreading coefficient is especially confusing. At equilibrium it is (almost by definition) equal to zero. The predictions are highly unreliable in an asymmetric way. If they say that a given oil will not be a good antifoam for a system the predictions are correct. But the opposite is often not the case: many predictions consistent with good antifoams yield poor antifoam behaviour. Clearly something is missing. One extra factor must be that the oil drop (or particle radius) is large enough to break through the wall. Very small drops/particles will be ineffective. Yet even when the size is large enough, the antifoaming behaviour is unsatisfactory. Hydrophobic particles on their own tend to behave similarly to oil drops on their own (though the detailed mechanisms must be different as the particles cannot flow like oils). The combination of particles and oil is generally far more potent. The oil seems to set the scene but is hampered by the issues discussed below. The particle is able to achieve the required breakthrough. Particle shape can have a profound effect, with jagged particles likely (but not always) to be more effective. The first missing link is the concept of the Entry Barrier. The drop or particle might be thermodynamically capable of disrupting the film, but to do so it has to get into the film. A strong "wall" of surfactant can provide a potent barrier against entry. Although there is no obvious way to calculate this barrier, it can be measured using the Film Trapping Technique (FTT)1. Trap some liquid containing a potential antifoam between an air interface and a glass surface in a glass capillary with a typical internal radius of 3mm. Looking with a microscope through the glass watch what happens to the antifoam oil/particles as the air pressure is steadily increased and the air interface is pushed towards the glass. 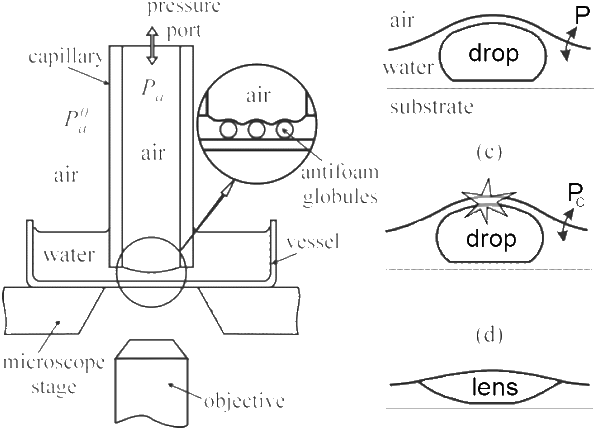 As shown on the right of the image, at a certain critical pressure, Pc, the oil/particle is pushed through the interface and the "drop" becomes a "lens". When Pc is high it is very difficult for an antifoam to act, when Pc is low then the antifoam stands a good chance of working. Every antifoam worker should have an FTT instrument to understand what is going on! What controls Pc? Obviously γOW,γOA and elasticity are important, but size and (for particles) shape are also important. Smooth, round particles are (other things being equal) much less effective as antifoams than sharp, pointy particles. Because the FTT uses a microscope, the shape/size of the drops/particles can be measured at the same time as Pc. Because Pc is so important and because the FTT apparatus is relatively simple it would seem that we should all be using the technique. However, the current technique requires lots of skill and patience and doesn't readily transfer into the industrial environment. Maybe some reader can take up the challenge to devise an automated variant of the FTT so we can all use it routinely. Readers of antifoam literature may come across the term "pseudoemulsion". This is used to describe the oil drop up against the water/air interface. The term is intended to be helpful because emulsion science can be used to describe it, e.g. via disjoining pressures. Even with E,B,S and Pc on your side you might still get bad foam. The final confusing factor is that antifoams can act in fast mode and in slow mode. Note that the physics of fast and slow modes is the same - entry and bridging coefficients, entry barriers etc. ; it is the location of the rupture of the foam which differs between the two modes. Fast mode is easy to understand. As the foam is being created, drops/particles that can get through the relatively thick, wet film will break the bubbles before they have a chance to form. Surfactants that quickly reach the surface but produce a low elasticity and (perhaps a similar thing) a low Pc will be easily broken. But if the surfactant creates a high elasticity and/or high Pc directly or if co-foamers can get to the surface before the antifoam, then the chance of quick breaking of the foam are lost. This elasticity argument has some merit but, as the elasticity app shows, it implies that more surfactant can reduce elasticity so should make a foam weaker - a behaviour that is not generally found. Similarly, if the drops/particles are much smaller than the thickness of the foam wall they will not effectively bridge the wall so breakage doesn't happen.
. As the foam film thins by capillary action (i.e. nothing to do with "Drainage" as the liquid volume in the films is so small) the drops/particles tend to be swept into the large PB and nodes. So even though a well-drained foam film will be thinner than the drop/particle radius, the drops/particles are no longer in the films and are sitting doing nothing in the large PB (there is a beautiful image of this in the Latte discussion of espresso cremas). So for a while the foam is stable. But as the foam starts to drain the size of the PB shrinks (r∝√ε where ε is the liquid fraction) till it becomes comparable to the radius of the drop/particle. At this point, if the pressure created is greater than Pc the PB will be broken and the foam will start to decay. Antifoam oils or particles are hydrophobic. This means that they can be difficult to disperse and added to the system. But of course, it's easy to disperse oils/particles simply by adding surfactants. 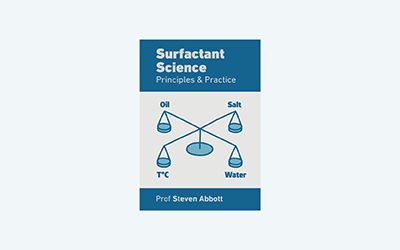 So here's the first contradiction - if the surfactant in the system isn't good at dispersing the oil or particle then the antifoam may sit in useless lumps at the surface or at the bottom, but if the surfactant is too good at dispersing then the oil drops can become far too small to be effective and the particles might be totally covered by a surfactant shell, rendering them completely hydrophilic and useless. The oils/particles are sitting comfortably within large PB and the drainage is so slow (small diameter bubbles, rigid surfactant) that they never get the chance to break a wall or PB. It has often been noted that specifically for silicone oils containing hydrophobic particles the original excellent antifoam activity falls off over time. One explanation for this is that the particles "disproportionate". This means that if two oil drops each containing 4 particles happen to meet and fall apart again, one ends up with 6 particles and the other with 2 and after a while a few drops have all the particles and the rest have none. The causes, cures and generality of this specific failure mode are hotly debated. They are so slow at getting to where a bubble is being formed that most of them are sitting uselessly in the bulk solution with no chance to participate in either fast or slow antifoaming action. In many processes such as bio-fermenters, the antifoams were so good at getting to the bubble interface that after a while they have all been removed from the bulk and are sitting uselessly at the surface of the previously broken foam. Only a fresh injection of antifoam into the bulk will allow new bubbles to have a supply of antifoam. The previous section partly explains why it is so hard to find the perfect antifoam. Even if E,B,S and Pc are in good control (and often they aren't), even if the differences between fast and slow antifoamers is understood (and they often aren't), it is still difficult to ensure that the majority of the antifoam drops and/or particles are in the right place at the right time. Too much of anything (too hydrophilic, too hydrophobic, too well dispersed, too poorly dispersed) is a bad thing and getting everything in balance is hard. If there is not enough antifoamer in the foam it will never break, but if the antifoamer in a broken foam can't get recycled into the bulk solution it is lost. There is no a-priori reason why oils should be better than particles or vice-versa (though designing a good particle is harder than throwing in an oil). The success of oil+particle antifoams would seem to be partly due to the contradictions in any antifoam formulation and there is a different balance of contradictions for oils and particles so they can perhaps mutually compensate each other. However, it is also clear that in terms of breaking through the entry barrier, particles combined with oils seem to be uniquely good. then your chances of successfully defeating foam are greatly increased. At the same time, those who want reliably to generate a good foam that is resistant to oils, particles etc. should have a good understanding of all these factors so they can formulate to avoid disappointment. This image from Prof Stubenrauch's group in Stuttgart captures the three key components of a foam: Film (or wall), Plateau Border (PB) and Node. For a bubble of diameter D the PB has a length L~D/2.7 in an ideal "Kelvin foam"